The deadly floods in Iran have devastated many regions of the country and have left many in dire need of resources and help. Many U.S. individuals and entities have contacted our office asking how they can donate to the cause while also ensuring that they are complying with U.S. sanctions law. If you have any questions regarding this matter or if you are a non-profit organization and would like additional information or guidance regarding how to legally raise funds for the flood relief effort, please feel free to contact our firm. It will be our pleasure to provide you with pro bono assistance. The confusion about the types of permitted fund transfers stems from the use of the Persian verb “havala” to describe the informal fund transfer system hawala. “Havala”, from the Arabic verb tahweel, has the general meaning of “to transfer”, and Persian speakers use “havala” to describe any fund transfer, for example, through Western Union, Venmo, a third country bank or any other type of deposit into a bank account. The United States government permits transfers to and from Iran through third country banks for certain types of transactions, such as remittances, inheritance, or sales of real property. The verb, however, could also denote a transfer through the hawala system, which is not allowed under the Iranian Transactions and Sanctions Regulations (ITSR). As many are familiar, the hawala system is an informal method of transferring money between countries that relies on personal networks and trust. For example, Customer A in Iran wants to transfer money to his family in the USA. He goes to a hawaladar (or broker in charge of arranging these types of transfers) in Iran and gives him a sum of money to transfer. The hawaladar then finds a customer in the USA who wants to send money to his/her family in Iran. The hawalader then deposits the funds he received from Customer A into an account Customer B provides in Iran. The hawaladar in return asks Customer B in the USA to deposit the dollar equivalent of that amount to Customer A’s family member’s account in the USA. Therefore, both customers A and B are able to successfully send funds to their families through this system without ever actually moving money across borders or through banks. Many prefer the hawala system to formal banking options because it is often more convenient, quicker, and requires less documentation than banks for legitimate transfers between expatriates and their home communities. Moreover, hawala networks thrive where the formal bank sector is weak or where no formal banking relationship exists, such as between the United States and Iran. The very features that make the hawala system attractive for users are also the reasons why authorities are concerned to scrutinize and regulate these sorts of transfers: because of their opacity hawala transfers could facilitate the financing of terrorism, money laundering, or the circumvention of sanctions. For these reasons, governments have started asking hawaladars to record their transactions and have even prohibited the use of hawala to transfer funds between certain countries, as the United States has with Iran. Moreover, the use of hawala for illicit activities means that individuals making innocent use of the hawala system may unwittingly be implicated in a criminal conspiracy. For example, settling liability between transferring and receiving hawaladars may involve serious illegal activity, such as fraud, sanctions evasion, or narcotics trafficking. We, therefore, strongly discourage the use of the hawala system to transfer money between the United States and Iran. When sending or receiving funds to and from Iran, you should only work with currency exchange brokers who send funds through third country banks and you should never allow direct deposits of any kind into your account from within the United States. And, as always, please be sure that your transfer is compliant with current U.S. sanctions law and that you submit all the proper documentation to your bank prior to each incoming wire. Because of the uncertain economic situation in Iran, many individuals who have real property in Iran would prefer to gift it to their children or other family members, including US persons, while they are still alive instead transferring title of the property as an inheritance after their passing. While this makes perfect sense if one wants to avoid possible probate and other legal issues and inheritance taxes in Iran, transferring title of real property to a US person as a gift is a violation of current US sanctions regulations. The Office of Foreign Assets Control (OFAC) currently prohibits US persons from making any new investments in Iran without its prior authorization. 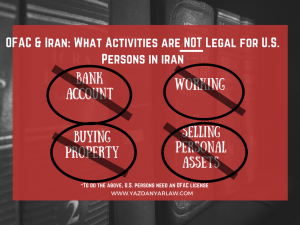 Under OFAC regulations the acquisition of real property in Iran by US persons, including any type of title transfer or transfer of property, is considered a type of investment and therefore is prohibited. The only condition on which US persons can receive transfer of title to real property in Iran is if OFAC has authorized such a transaction. OFAC does, however, authorize US persons to acquire and sell real property in Iran if they inherit that property. Moreover, according to Reg: § 560.543 of the Iranian Transactions and Sanctions Regime (ITSR) US persons may engage in transactions necessary and ordinarily incidental to the sale of real property in Iran, such as engaging the services of an attorney, funds agent, or real estate broker. US persons may also transfer the proceeds from sales of real property in Iran to the United States only if they acquired the real property before becoming a US person or inherited it from persons in Iran. 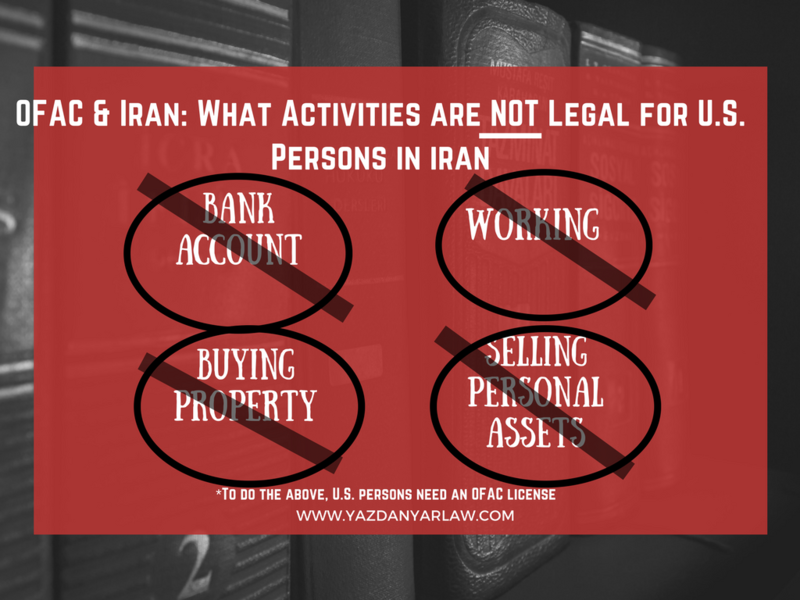 Although the inheritance of real property is permitted, OFAC does not consider a gift of real property from an Iranian national who is still living an inheritance. For this reason US persons must obtain specific authorization from OFAC (i.e. a specific OFAC license) before the transfer of title in order to legally accept the gift. Furthermore, if US persons wish to sell the property they acquire as gifts, they must again obtain another license from OFAC, as that transaction falls outside the scope of general licenses issued by OFAC. As for other forms of property, such as vehicles, coinage, furniture, and the like, there are separate licenses that authorize US persons to receive these as gifts. And as with real property, US persons may inherit these items and transfer the proceeds from sales of them to the US, provide that they have obtained the necessary documentation attesting to the validity of the inheritance, sale, and transfer. Therefore if you are planning to accept a gift of any type of property in Iran, contact our office for more information on how to acquire the necessary OFAC license, to arrange the required documentation, and to disclose any past violations to the government. On Friday, October 13, 2017, President Trump announced that he will decertify the 2015 Iran Nuclear Deal. By way of explanation, as part of the Iran Nuclear Agreement Review Act of 2015, the administration must recertify to Congress every 90 days that Iran is complying with its obligations under the JCPOA. Absent this certification, Congress has the option to re-impose nuclear related sanctions. Therefore, although Friday’s announcement does not withdraw the United States from the Iran Deal, it does open the door for Congress to impose legislation that could potentially undermine the integrity of the deal. Please keep in mind that the nuclear sanctions primarily impact non-U.S. persons and other countries. Therefore, even with the lifting of the nuclear sanctions in 2016, U.S. persons and U.S. companies continue to be broadly prohibited from engaging in transactions or dealings with Iran and the government of Iran unless such activities are exempt from regulation or authorized by OFAC. Although the re-imposition of nuclear related sanctions may not appear to have direct legislative impact on what U.S. persons can do vis-à-vis Iran, it is unclear whether such additional sanctions could soon follow. What is clear, however, is that such an act could have grave consequences from a foreign affairs standpoint and will undoubtedly undermine U.S. national security and credibility. This is especially true since the administration has offered no evidence that Iran has violated the deal. Furthermore, a bipartisan group of national security leaders have verified the success of the program and have urged the United States to continue implementing the deal. If you have trouble finding your representative, please contact our office today. Trump’s Travel Ban 3.0: What Does it Mean? On September 24th, the Trump administration introduced a series of new travel restrictions on eight countries. Travel ban 3.0, for clarity sake, was in many ways predictable, but also contained a few significant surprises. The bottom-line for Iranian Americans and their friends and family abroad is that travel ban 3.0 continues version 2.0’s suspension of entry in the U.S. by Iranian nationals (among others) who lack a bona fide relationship with a U.S. person or entity. On October 18th, however, a new, indefinite suspension of entry into the U.S. by Iranian nationals will come into effect. Iranian nationals will no longer be permitted to obtain immigrant and non-immigrant visas for entry into the U.S., even including those who have a bona fide relationship with a US person or entity. Important exemptions remain, but travel ban 3.0 represents a near total denial of entry for Iranian nationals and others. As the next step the executive order instructed the Secretary of State to assess whether foreign countries fulfill these criteria and to request that the countries that fall short of these standards improve their practices. Finally, based on the findings of this review the Secretary of State would recommend to the president which countries to target with the new travel ban. While the Departments of Homeland Security and State were engaged in this work, version 2.0 suspended entry into the U.S. of nationals from six predominantly Muslim countries. Several rulings by U.S. courts placed injunctions on this order, although the Supreme Court lifted these injunctions and allowed the administration to deny entry to nationals from those countries who lack a bona fide relationship with a U.S. person or entity. This suspension will remain in effect under the new travel ban. The results of the review by the Department of State are in, and the following countries were found to be deficient in each of the three aforementioned criteria: Iran, Libya, Syria, Yemen, Somalia, North Korea, Chad, and Venezuela. Starting October 18th, nationals from these countries – with the exception of Venezuela and Somalia – will be denied both immigrant and non-immigrant visas for entry into the U.S.; this ban also includes nationals who have a bona fide relationship with a U.S. person or entity. As for Venezuela the ban applies only to certain top officials, and Somalis are permitted nonimmigrant visas. Although travel ban 3.0 places stringent restrictions on entry, certain general exemptions, case-by-case waivers, and country-specific exemptions are allowed. 6. Nationals already granted asylum or refugee status in the U.S. Case-by-case waivers may be granted at the discretion of consular officers to nationals for whom denial would cause “undue hardship”, who do not pose threats, and whose entry would be in the national interest. Individuals in this category could include nationals who have already been admitted to the U.S. on work or study visas, or who have “significant contacts with the U.S.”, but will be outside the country on October 18th; who have “significant business or professional obligations” that would be impaired if denied entry; who, seeking to visit a family member who is a lawful permanent resident, would incur “undue hardship” if denied entry; who are seeking entry for medical care; or who are or have been employed by or on behalf of the U.S. government. If you think you might be eligible for this waiver, please call our offices, or consult an immigration lawyer. The new travel ban also grants exemptions that are unique to the individual designated countries. Iranian nationals, for example, are permitted to enter the U.S. on a student visa (F and M) or an exchange visa (J), though they should expect enhanced scrutiny. Unlike the previous two iterations of the travel ban, version 3.0 succeeds in cloaking the restrictions in a veneer of rationality, deliberation, and objectivity; however, upon a closer look it is clear that the travel ban remains a poorly written regulation. The most glaring example is the dropping of Sudan from the list of targeted countries. While Iran is chastised as a state sponsor of terrorism, there is no mention of Sudan, which continues to appear alongside Iran on the Department of State’s list of designated state sponsors of terrorism. Then there are the surprising additions of Chad, North Korea, and Venezuela to the list. Chad, for one, has been a valuable partner in the fight against terrorism in the Sahel, as the new ban itself acknowledges, and is not often cited as a source of destabilizing terrorism. Moreover, North Korea is not a source of immigrants to the U.S., as its government does not allow its citizens to leave the country. The choice to target certain top Venezuelan government officials, to the exemption of ordinary citizens, is in line with new financial sanctions placed on Venezuela in August, yet the rationale presented in the travel ban is perplexing. Despite the fact that Venezuela’s government is “uncooperative” and its information sharing policies “inadequate”, the text of the ban asserts that U.S. government has access to “alternative sources” to verify the identities of Venezuelan nationals. For this reason, the Secretary of State’s review recommended imposing restrictions only on the top government officials “who are responsible for the identified inadequacies”. The order does not specify what those “alternative sources” are. Nor does it defend the choice of officials’ role in setting travel policy as the criterion to determine which officials should be designated. In short, travel ban 3.0 will significantly curtail entry into the U.S. of nationals from several countries, and its convoluted regulations will create difficulties for officials working to enforce them and for individuals specifically exempted from the restrictions. Therefore, if you or a member of your family is planning to enter the U.S., we advise that you consult with an immigration lawyer prior to travel so that you know if and how you will be affected.